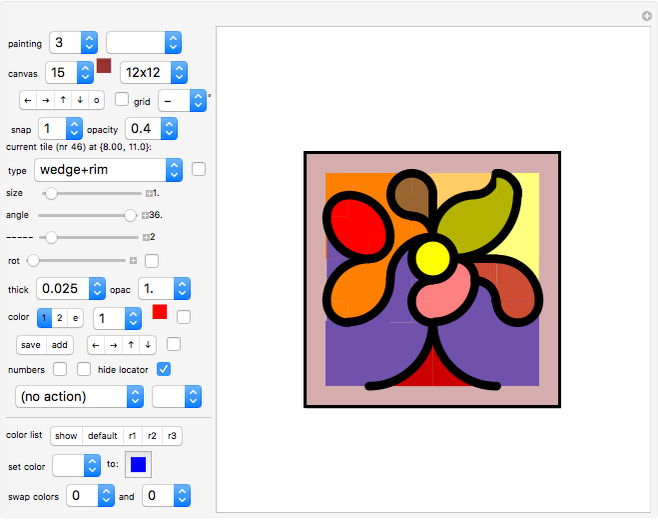 This basic graphics tool lets you create simple bold designs, some resemble stained glass windows and others resemble pop-art designs. The ten snapshots are samples to give you ideas about what you can do with this Demonstration. This Demonstration offers you a range of basic tiles that you can rotate and color to your taste. So-called "actions" help you order and reorder the sequence of tiles used. Since tiles can overlap, their sequence is important. Only the last tile (the one with the highest sequence number) can be edited, but any tile can be brought up to be in the last position and later (after editing) be reinserted in its original position. Play with the given examples in the snapshots to see what this Demonstration can do or cannot do. Click a number to select the painting you want to work on. Select "copy" to store the painting for pasting it later to another painting number. Select "paste" to store the painting under a new painting number. Select "default" to reset the graphics board to its default values. Here you select the color and size of your (optional) canvas. The color setting is given by a color number that relates to the color list (which, if activated, is placed at the bottom of the graphics area; see below). Click one of the four arrows to shift your painting to the left, right, up, or down by one unit. Click "o" to rotate the painting by 90°. Click the checkbox for micro-manipulating the painting: all shifts by clicking arrows will be by 0.1 units only. Switch off "snap" before you use the micro-manipulation! Select "60" to create an isometric lattice grid with unit spacings that helps you to position your tiles. Select "90" to create an orthogonal lattice grid with unit spacings that helps you to position your tiles. This control only works if a grid is selected (see above). Select snap = 1 to snap the locator (and with it the currently edited tile) to the grid. 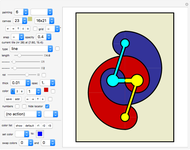 Select snap = .5 to snap the locator to grid coordinates that are multiples of 0.5 grid units. 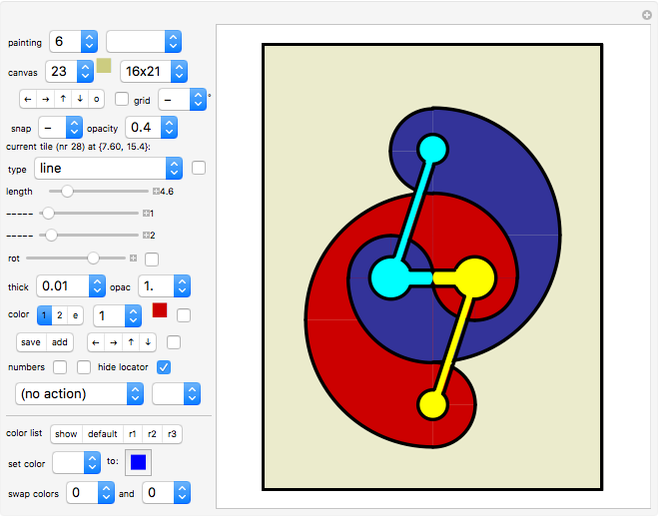 Select snap = .1 to snap the locator to grid coordinates that are multiples of 0.1 grid units. Use this control to make the canvas transparent. This makes the grid visible, if it is selected. •et; "90° wedge" tiles are square tiles carrying 90° sections of a disk on a square background, without an outline. Wedges have a primary color ("color1") and a secondary color ("color2"); see below. The background can be made transparent by setting the secondary color number to zero. •et; "90° rimmed wedge" tiles are 45° wedges with an additional curved edge (rim). Rimmed tiles have a primary color, a secondary (background) color, and an edge color. The background can be made transparent by setting the secondary color number to zero. •et; "arc" tiles give a partial outline of a circle. Arcs only have an edge color. •et; "line" tiles are straight lines. Lines only have an edge color. •et; "diagonal" tiles are upward-sloping diagonal lines (when not rotated); their true length is the selected "size" multiplied by the square root of 2. They only have an edge color. Use the rotation ("rot") slider or checkbox to create downward-sloping diagonals. •et; "triangle" tiles are right triangles without outline. They only have a primary color. The three sizes determine the vertices of the triangle, being positioned to the right, top, and left of the locator (when the tile is not rotated). •et; "triangle+rim" tiles are right triangles with marked edges. They have a primary color and an edge color. •et; "triangle rim" tiles are outlines of right triangles. They only have an edge color. •et; "rect diag" tiles are two-colored oblongs with a diagonal as a dividing line between the colors. They have a primary color and a secondary color. Set the secondary color to zero to obtain edgeless triangles. •et; "rectangle" tiles are monochrome oblongs. They only have a primary color. •et; "rectangle+rim" tiles are oblongs with marked edges. They have a primary color and an edge color. •et; "rectangle rim" tiles are outlines of oblongs. They only have an edge color. •et; "wedge" tiles are partial disks. They are defined by their radius (size) and an angle (10-fold value of the second size entry). They only have a primary color. •et; "wedge+rim" tiles are wedges with a curved edge. They have a primary color and an edge color. •et; "2-rimmed wedge" tiles are wedges with edges all around. They have a primary color and an edge color. •et; "ellipse&CloseCurlyDoubleQuote; tiles are ellipses without a rim. They only have a primary color. •et; &OpenCurlyDoubleQuote;ellipse+rim" tiles are ellipses with a rim. They have a primary color and an edge color. •et; "ellipse rim" tiles are ellipse outlines. They only have an edge color. •et; "star" tiles are regular polygons (if size3 = 0) or star-shaped polygons without a rim. They only have a primary color. The first slider controls the number of vertices. •et; "star+rim" tiles are regular polygons (if size3 = 0) or star-shaped polygons without a rim. They have a primary color and an edge color. The first slider controls the number of vertices. •et; "star rim" tiles are outlines of regular polygons (if size3 = 0) or stars. They only have an edge color. The first slider controls the number of vertices. The separation of the tile types with edges on the one hand and without edges on the other hand is important. When you design a stain glass window, for example, this separation allows you to change the thickness of the grouting globally (for all "edged" tiles at the same time). Select up to three values for your tile. The sliders have accompanying texts that differ among the file types. Lines only have a length, rectangles have width and height, and triangles use all three sizes. Arcs and wedges use angles in degrees (tenfold the second size). Explore! Use the rotation slider to rotate the currently edited tile. Clicking the checkbox repeatedly cycles the rotation of the currently edited tile through multiples of 45°. Select the thickness of the lines, arcs, and edges. Not all tiles have lines, arcs, or edges associated with them. Select the opacity of the tile. Use the "color 1/2/e" setter bar to select whether you want to edit the current tile's primary, secondary, or edge color. Note that not all colors are applicable to all tile types. Use the color selection popup menu to select a color number. The associated color from the color list will be displayed next to it. Click the checkbox to bring up the next color from the color list. Click "save" to store the current tile and also all tile-independent information (such as the color of the canvas). Click "add" to store the current tile and immediately create a duplicate of the current tile. Note that the original tile will be drawn where you last saved it by clicking "save"! If you want the original tile and the duplicate to appear at the same place, click "save", then click "add" right after each other. Click one of the arrows to shift your painting to the left, right, up, or down by one unit. Click the checkbox for micro-manipulating the tile: all shifts by clicking arrows will be by 0.1 unit only. Switch off "snap" before you use the micro-manipulation! Click the first checkbox to display the sequence numbers of the tiles. If some numbers are hard to read because they are placed on top of each other, click the second checkbox. This will slightly displace the numbers so you can read them better. You may have to click this checkbox several times. You can also try action "show number" (see below). Click to hide the locator and the currently edited tile. First select an action, then select the associated tile number. Remember that only the last tile (the one with the highest number) can be edited! action "move .. to top"
Click to make the selected tile the last one. Only the last tile (the one with the highest number) can be edited! action "copy .. to top"
Click to copy the selected tile and make its duplicate the last tile. Only the last tile (the one with the highest number) can be edited! Since you can place as many tiles on top of each other as you like (often partially overlapping), it is often important in which sequence the tiles are ordered. Action "renumber as .." lets you insert the currently edited tile to any place in the queue you want. All other tiles will be renumbered as necessary. Click to delete the currently edited tile (which has the highest sequence number). Click to delete a tile. action "delete all > .."
Click to delete all tiles with a sequence number greater than the selected tile. action "delete all < .."
Click to delete all tiles with a sequence number smaller than the selected tile. Click to apply the current part's edge color to all parts. Click to apply the current part's edge thickness color to all parts. Click to make the system show the position of the tile with the selected sequence number. This is only useful when checkbox "numbers" is switched off. If you are not sure what tile is associated with this number, use action "copy to top" for this number and then delete the additionally created tile when you are finished. Click "show" to show/hide the color list. Click "default" to reset the list of 32 colors to its default value. Click "r1" to replace each color in the list by a randomly created color. Click "r2" to create a list of 31 light colors. Color 32 (usually black) stays unchanged. Click "r3" to replace 20 randomly chosen colors of the list by a randomly created color. Color 32 (usually black) stays unchanged. "set color .. to .."
Here you select a new RBG color for one of the 32 colors in the list. 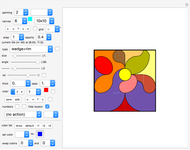 Select a color number, then click the square color swatch to edit the color. "swap colors .. and .."
Select the numbers of two colors to be swapped. •et; Use the "save" button often! •et; Click the small "+" signs after the sliders to insert values with the keyboard. •et; To draw a circle, select "wedge" or "rimmed wedge" and set the angle to 360° (set the second size to 36). •et; Some paintings do not show a locator. To make it visible, click the "hide locator" checkbox. •et; Painting "3" was created from painting "2" by increasing the thickness of the current tile with the thickness control and then selecting action "thickness all". Also, a different canvas size and canvas color were selected. •et; Only the last tile (the one with the highest sequence number) can be edited. However, any tile can be edited by making it the last one (action "move .. to top") and later storing it where it came from (action "renumber as .."). Study the actions; they are very useful! Karl Scherer "Basic Graphics Tool"